Zion Market Research has published a new report titled “Cold Chain Market by Type (Refrigerated Storage and Transport), by Temperature Type (Chilled and Frozen), and by Application (Dairy & Frozen Desserts; Meat, Fish, and Seafood, Fruits & Vegetables, Bakery & Confectionery, Pharmaceuticals, and Others) - Global Industry Perspective, Comprehensive Analysis and Forecast, 2017 – 2024”. 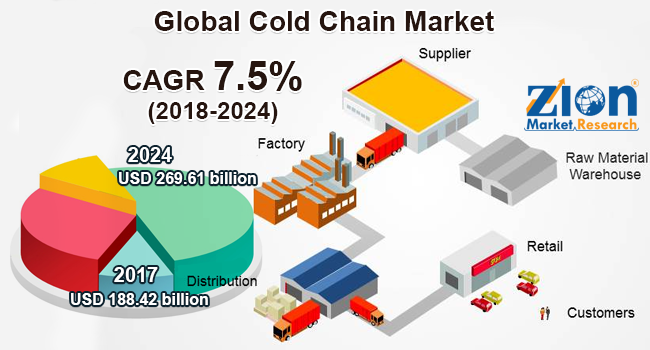 According to the report, the global cold chain market was valued at around USD 188.42 billion in 2017 and is expected to reach approximately USD 269.61 billion by 2024, growing at a CAGR of around 7.5% between 2018 and 2024. The cold chain is a system that is used for the management and transportation of temperature sensitive products through refrigerated and thermal methods of packaging. There are various ways in which cold chain products are transported such as railcars, refrigerated trucks, air cargo, and refrigerated ships. The cold chain is a technology that completely depends on the physical means for maintaining appropriate conditions of temperature. The cold chain is also referred to as the temperature controlled supply chain. The global cold chain market is anticipated to grow at the highest CAGR during the forecast period. The growth of the market is primarily driven by rapidly expanding industry of perishable products including vegetables, fruits, meat, and fish and the increasing investments in distribution and logistics industry. Increasing trend of online shopping, rising penetration of cold chain in agriculture produce transportation, and growing movement of medical supplies & pharmaceuticals internationally are the main factors anticipated to increase the growth of the cold chain market in the forecast period. On the basis of type, the cold chain market is categorized into refrigerated storage and transport. Growing preference for packaged and ready to eat products and changing lifestyles are driving the growth of the refrigerated storage segment. On the basis of temperature type, the market categorized into chilled and frozen. Increasing disposable income and busy lifestyles are boosting the demand for frozen food products. Based on application, the cold market is divided into fruits & vegetables, dairy & frozen desserts, bakery & confectionery, meat, fish and seafood, pharmaceuticals, & others. The growing importance of the cold chain supply chain in storing and transporting biological products such as vaccines are expected to contribute to the high demand of the cold chain in the pharmaceutical segment in the forecast period. The North America cold chain market is growing at the highest CAGR during the forecast period. The market growth is primarily due to the large consumer base and rising penetration of connected devices. The market offers great opportunities for the new entrants. Europe is the second largest cold chain market. Powerful economic environment and increased global trade are the key factors driving the growth of the cold chain market in the region. Asia Pacific region is anticipated to exhibit considerable growth in the forecast period owing to the highest production of agricultural produce. Increasing initiative and investments by the government for improved logistics and warehouse infrastructure and growing technological advancements in storage, packaging, and processing of seafood products are the key factors projected to enhance the growth of the Asia Pacific cold chain market in the forecast period. Standard government guidelines in packaging, storage, and transportation of fresh foods are projected to drive the cold chain market growth in Latin America in the forecast period. Increasing popularity of frozen meat products and growing foreign direct investments are driving the growth of the cold chain market in the Middle East & Africa. The key players in this industry are AGRO Merchants, Lineage Logistics, Preferred Freezer, Burris Logistics and Nichirei Logistics, Americold Logistics, Kloosterboer, Interstate Warehousing, VersaCold Logistics and Swire Cold Storage. The detailed description of players includes parameters such as company overview, financial overview, business strategies, and recent developments of the company.